This is an unpublished Torres Straits catch, kindly given me by Dr. Haddon. The native name is Buli. First: Hold one string of the loop between the tips of the thumb and index of each hand so that about six inches of the string passes from hand to hand and a long loop hangs down. Then in the short piece between the hands make a small ring hanging down, by passing the right hand toward you and to the left and placing the string it has been holding, between the tips of the thumb and index of the left hand, on the near side of the string already held by these fingers. 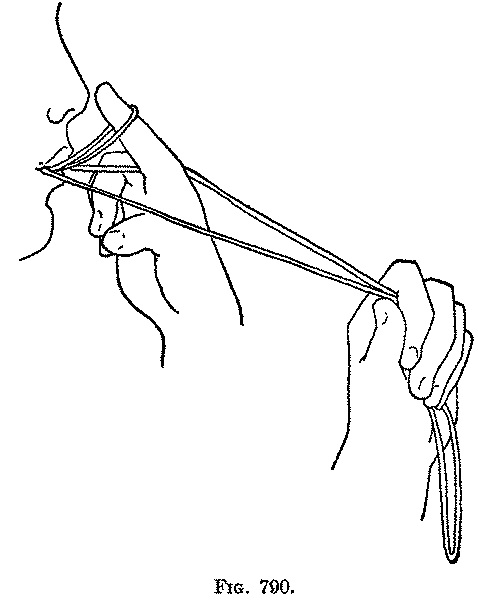 Second: Hold the ring thus formed between the teeth where the strings cross, the original right hand string crossing below the original left hand string. Hold the long loop straight down with the left hand. 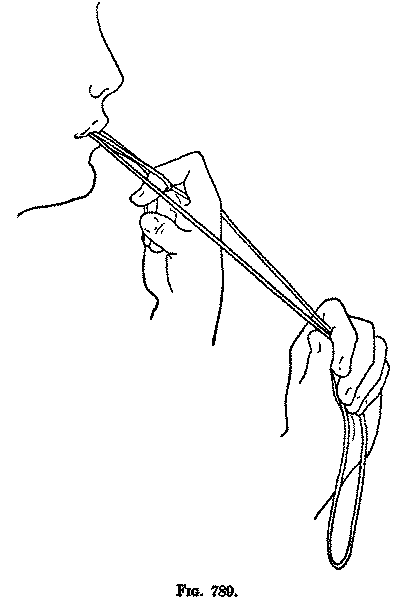 Third: Pass the right index away from you through the long hanging loop, with the palmar surface facing you; then bend the finger toward you and hook it over the lower hanging string of the small ring held in the mouth (Fig. 789). Move the right hand to the right on the near side of the right hanging string of the long loop, and put a twist on the loop held by the right index, by turning the finger to the right and up so that the palmar surface faces you. Fourth: Move the right hand to the left, and put the right index (with its back from you) away from you through the long hanging loop; then place its tip on the tip of the nose (Fig. 790); release the loop held by the teeth, at the same time pulling down the end of the long hanging loop and protruding the tongue. The string should then come free from the right index. It is very evident that the twist you put in the right index loop (in the Fourth movement) untwists the cross in the ring held by the teeth.